Mi2N: Rick Vines Debut Release "So Happy!" 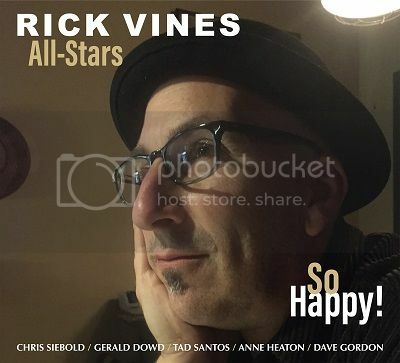 Rick Vines Debut Release "So Happy!" "It gives me the strength to say... what do you know about it anyway" -­‐Rick Vines, "Secrets"
selection of ten songs that speak the truth. He set out to make a record with wide appeal, not necessarily demanding of the listener's full attention. But should one choose to tune in and listen closely, one would find meaning and significance in the melody and lyrics. In this respect, So Happy succeeds. The ten track album is clean and polished, but not so much as to dehumanize the sound. Recorded at IV Labs studio in Chicago (notable output from IV includes jam rock Umphrey's McGee, soul singer Cole DeGenova, and hip-­‐hop band Sidewalk Chalk) the record treats themes diverse and far-reaching, from self-referential social criticism and light-­‐hearted mocking to deeply personal stories of loss, faith, love and redemption. This range also expressed in the multiplicity of genres that appear here is juxtaposed with a consistent sonic palette, giving the record a cohesive and listenable character. The record begins with the title track "So Happy," featuring Bassist Tadd Santos' driving bass line, pop style handclaps and a vocal performance reminiscent of an uplifting REM tune. But the happy go lucky sound masks the lyrical content, a commentary on selfie culture. The way we present ourselves on social media isolates us from one another, and even ourselves. How much time do we spend staring at smiling faces, erroneously assuming that the grass is really greener? How often do we tailor our own images so that someone else assumes the same? Examining the twisted hypocrisy of consumer culture, Vines accompanies this theme of isolation with "Giant Can Of Beans," employing this contrast of sonic style and lyrics: the sound is whimsical with washes of guitar and keyboard accompanied by melodic interjections from lead guitar. Still we keep "our doors locked tight." Vines uses his experience to craft a way of looking at the world, both thankful for the comforts of house and home while critical of the effacement that comes with that life. To create So Happy Vines was joined by an all star cast of studio musicians with considerable accomplishments in their own right. Each gets time to shine. Guitarist Chris Siebold stands out on the Allman Brothers styled blues rock track treatment of Joni Mitchell's "Woodstock" where his thick tone and searing licks cut through the driving rhythm beds filled out with the Hammond B3 organ. His more sophisticated side shows up on the jazz ballad "Nights Like This," evoking Jim Hall or Barney Kessel with a classic archtop guitar sound alongside pianist Dave Gordon's chordal support. Drummer Gerald Dowd (holding a longtime post with prolific country singer-­‐songwriter Robbie Fulks) is heard in full force on the classic rock tune "D'Lila." All of these elements are seamlessly woven under the direction of producer Anne Heaton. Vines reached out to Anne with his catalog of work in 2016. She weighed in on song and studio selection, as well as arranging, tracking, and even composing and performing original vocal parts. "In my heart of hearts I'm a collaborator," she says of her style, which often gives "more leeway to explore and break rules." Her presence is powerful on the lush vocal arrangements at the end of "I Can't Breathe," Vines' tribute to the tragedy of Eric Garner's choking death at the hands of New York City police officers. From the perspective of Garner, Vines sings "tell my wife and kids, I'm doing it for them." With a wife and child of his own (whose struggles and stories appear in the semi-autobiographical "Making My Way") Garner's death strikes close to home. This debut record brings a heavy dose of disillusionment and self-deprecation, tempered by humor and hopefulness.